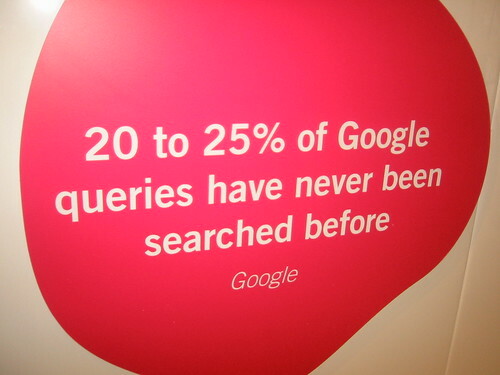 "20 to 25% of the queries we see today, we have never seen before"
This implies that Google has kept records of search terms "for all time". Otherwise, a claim like "never before" is empty. It would be easy enough for someone to check the semi-anonymised search logs that AOL released, to check whether this figure is ballpark. My own guess is that the figure of 20 to 25% doesn't just refer to the text of the search term, but to the totality of the query: search text, country, personalization etc. That's definitely not true. If you took into account all these factors, most queries would be unique. I wonder if they count the suggested queries, refined queries and the spelling-corrected queries as different ones? Ionut: I wonder if that's the case. I would think that most search queries come from people who are not logged in, and are for really common searches e.g. [paris hilton]. Yes, but there are also people that enter questions. And those questions can be pretty long/complicated/diverse. There are also news that talk about not-very-well-known persons/events, people that enter URLs in the search box, spelling errors, subjects that very few people are interested in. Philipp, I think that's a pretty accurate estimate if you look over a time period of a month or so. So if you had queries from the last month or so, 20-25% of queries the next day would be new/unique. It also depends a little bit about whether you're defining it only as web queries, or all queries to Google (e.g. blog search, book search, patent search, etc.). The README file for the AOL search log  tells us that the log contains 21,011,340 searches comprising 10,154,742 unique queries (after normalising to lower case and removing most punctuation). In other words, the average number of occurrences for each query was about two. A quick browse  through some of the AOL data  shows that many queries appear more than twice, so there must be a large number of uniques to compensate. A larger data set, such as Google's, would have fewer uniques, but this quick glance at AOL's logs leaves me satisfied that 20-25% uniques after a month is believable. Coming at this from a different angle, section 2 of the published paper "A Picture of Search" by AOL/Raybeam  is interesting. From figure 2.1 it looks as if their data shows that the top 25% of searches came from just 5000 unique queries whereas the bottom 25% of searches came from 80 million unique queries. Figure 2.3 sheds some light on the difference between "not this month" and "never". About 65% May's queries also occur in June, but under 40% of May's queries also occur in the following November, and only about 25% of May's queries also occur in the following April. The paper includes lots of other interesting information. For example: the average search query contains 3.5 terms (words); 20% of the users perform 70% of the searches; 40% of users on a given day perform only one search that day, etc. Who'da thunk :-) – that's a big number.